Below you will find our list of the best restaurants in Berlin as determined from reviews by Michelin, Gault & Millau, Der Feinschmecker, Schlemmer, Varta, Gusto, and Der Grosse Restaurant Guide. The level of quality is so high, there are six 2 Star Michelin restaurants in Berlin and a further thirteen with 1 Michelin Star. This elegant 2 Michelin Star restaurant from chef Christian Lohse serves up exquisite, finest quality creations including many delicious gourmet dishes and fish specialities, all served in the most exclusive ambience of the 5 Star Regent Hotel Berlin. Choose from a set menu, a la carte option or, for €220+ per person, you can even book the Kitchen Table with three friends (Thursdays only) and gain an intimate insight into the working of a world-class kitchen. Open every day from 18:30 until 22:30. Smart casual dress code. The perfect restaurant in Berlin for unconventional gourmets seeking a culinary experience. This 2 Star Michelin modern avant-garde restaurant from Der Feinschmecker's Chef of the Year 2015, Michael Kempf, is located in the beautiful 5th floor inner courtyard at the 5 Star Mandala Hotel and has been serving elegantly light fare accented by purist luxury since July 2001. Desserts are a highlight with Maître Pâtissier Thomas Yoshida being crowned Pâtissier of the Year 2016 by Gault&Millau. Open for lunch and dinner, with a choice of a la carte and set menus. Closed Saturday and Sunday. Born to Turkish parents in Berlin, Tim Raue was a former member of the infamous 36 Boys gang. Leaving his criminal past behind, he took to cooking, working in many of the restaurants also on this list, before, aged just 33, gaining his first Michelin Star and cooking for the likes of Angela Merkel and Barack Obama. This Thai and Chinese influenced restaurant near to Checkpoint Charlie won its second Michelin Star in 2011 and an incredible 19 Gault Millau points, making it the most decorated restaurant in Berlin. With A La Carte, Signature and Vegetarian menus, it is open for both lunch and dinner. Closed Sunday and Monday. This contemporary and relaxed restaurant in the plush Waldorf Astoria Berlin offers classic French cuisine reinvented at its finest in elegant surroundings with works of art that reflect the rich history of the city. Simple, but artfully prepared dishes are created under the wing of multi-Michelin starred French chef Pierre Gagnaire, one of the best chefs in the world and owner of the famous eponymous 3 Star Michelin restaurant in Paris, amongst many others in London, Gordes, Courchevel, and Las Vegas. A la Carte and Set Menus available, Open evenings only and closed Sunday and Monday. This excellent 2 Michelin Star and 18 Gault & Millau points restaurant is nestled in the historic Edison Höfen courtyards in Mitte, where once the first light bulbs were produced in Germany. One of the most exciting restaurants in Berlin, the special industrial charm of the historic courtyards complement the creative cuisine of Daniel Achilles, who has been recognised as the best chef in Germany. Open evenings only with a choice of Set Menus. Closed Sunday and Monday. Far away from pomp and circumstance, young Austrian chef Sebastian Frank's 2 Michelin Star restaurant in Kreuzberg stands out with its subtle interior design which is in contrast to a first-class menu and fine wines. Having worked at Steirereck in Vienna, one of the best restaurants in the world, it's no surprise he is the rising star of the Berlin scene, being awarded a second Michelin Star in November 2015 and being crowned Best Chef in Germany 2016 by Gusto for his daring Set Menus. Evenings only. Closed Monday and Tuesday. Awarded a Michelin Star in 2014, this excellent family ran restaurant from husband and wife star chefs Peter and Sonja Frühsammer is located in the beautiful clubhouse of the Grunewald tennis club, a short drive from Berlin city centre. Sonja is the queen of the Berlin restaurant scene, a cook who incredibly developed her Michelin recognised skills via the canteen at Siemens, whilst Peter has hung up his whites to concentrate on the front of house, the wine menu and cattle breeding. To get there, take the S-Bahn to Hohenzollerndamm and it's a 10 minute walk along the same road, or a 25 minute walk from the Fehrbelliner Platz U-Bahn station. Open evenings for A La Carte and on Friday lunch. Closed Sunday and Monday. A Michelin Star restaurant in Berlin with a panoramic view from the 14th floor of the 5 Star InterContinental Hotel. Having worked in the kitchen as Sous-Chef to Thomas Kammeier since 1998, Eberhard Lange took over as Executive Chef in July 2015 and serves up delicious sophisticated creations made from German and regional quality products with international influence. A choice of Set Menus are served evenings only. Closed Sunday and Monday. Situated in the centre of Berlin, not far from the beautiful Gendarmenmarkt and the Deutscher Dom, this Michelin Star restaurant from celebrity chef Kolja Kleeberg offers regional rustic flair and innovative approaches in international cooking. The art nouveau restaurant was designed by top architect Meinhard von Gerkan, who was also responsible for Berlin Tegel airport and Berlin Central Station. Open for lunch and evening Set Menu meals. Closed Sunday. The Michelin-starred fine dining experience of "5" (Cinco) inside the cool Das Stue Hotel offers Paco Pérez’s avant-garde molecular-leaning Mediterranean cuisine. This is the fifth Michelin star for the former elBulli chef, having already received two for his flagship Miramar restaurant in his hometown Llança, and also for Enoteca in Barcelona. As well as an A la Carte menu, particularly impressive is the 25 course "Cinco Experience" tasting menu (€165+), made up of experimental remarkable small treats. Closed Sunday and Monday. Chef Marco Müller's cooking is something special and has earned this Berlin Mitte restaurant a Michelin Star. Excellently matched to the many wines on offer, which have won the restaurant awards for the best wine list in Germany, his many creations are small "global aromatic cuisine" masterpieces. The restaurant is not to be confused with the Rutz Weinbar next door. Closed Sunday and Monday. You'll find good classic German cuisine at this Michelin Starred restaurant from the multi-award winning chef, Markus Semmler. Having cooked for the likes of Queen Elizabeth II, Prince Charles, George Bush, Bill Clinton, Tony Blair, Gerhard Schröder, Helmut Kohl, Aeriel Sharon, King Juan Carlos I, The Sultan of Brunei, Robert De Niro, Karl Lagerfeld, Whitney Houston and Janet Jackson, amongst many other royals, politicians and celebrities, it seemed only natural he would open his own Berlin restaurant. The light, welcoming dining room with its open kitchen somewhat less formal than the 5 Star hotels in which he worked previously. A choice of tasting menus, open evenings only and closed Sunday and Monday. This amazing 1930s inspired Michelin-star restaurant and cocktail bar is located in the former Jüdische Mädchenschule (Jewish Girls' School) in Mitte, which dates back to 1928 and was taken over by the Nazis in 1930. The large courtyard at the back was used for deportations until 1941 but now offers a delightful place to dine in the summer, with a lunchtime menu also available. Arne Anker's classic German food is beautiful and the decor is stunning, transporting you back to a more happier pre-Nazi Berlin, with its brown tiles, chandeliers, green seating and high ceilings, with a torpedo decorating one wall. Closed Sunday and Monday. Supporting producers in and around Berlin, this "Vocally Local" Michelin Star restaurant from former Rutz (above) sommelier Billy Wagner voluntarily avoids using things not grown in the area - no pepper, lemons, chocolate or tuna, for example. It's all very seasonal and the 27 guests are sat around a long counter that wraps around the kitchen in the centre like a kitchen table at home, with everybody being served the same dishes (vegetarians and allergies catered for). Casual, this is typical hipster Berlin. Closed Sunday and Monday. Karl Wannemacher is a pioneer of fine dining in Berlin. Having worked during the 1970's as sous-chef at Maitre, the city's first 2 Star Michelin restaurant, he left to open this friendly Charlottenburg restaurant in 1982, the first of its kind in Berlin. Whilst the restaurant may have lost its own Michelin Star a decade ago, he continues in his sixties to create beautiful classic German dishes with excellent sauces and international influences, all served in traditional surroundings. Open evenings only, with an early bird deal between 17:00-19:00. Closed Sunday. This formal fine dining restaurant inside the Dormero Hotel Berlin Ku'damm offers a cross-over menu where Mediterranean meets local influences combined with "a touch of international chaos". 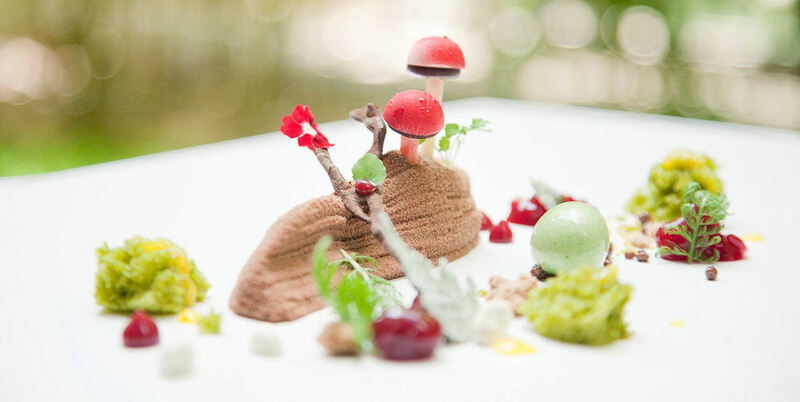 You will struggle to find many dishes prettier than Andre Haufler's creations. The intimate room sits just 22 people, with a further summer terrace, covered in winter. Closed Sunday and Monday. Bruno Pellegrini and Andrea Girau's avant-garde Italian restaurant near to Schloss Charlottenburg (next to Westend S-Bahn station) offers artistic and innovative cuisine, including their own non-pasteurised cheese. With a choice of a la carte and Tasting Menus, it is open every evening. Smart dress code. A short train ride out of the centre next to Innsbrucker Platz S-Bahn and U-Bahn station, this affordable Michelin Star restaurant is named not after Canadian popstar, Justin, but instead sculptor Richard Bieber who was responsible for the ornate dining room, which he built as a studio in 1894. Having been rebuilt after the War and operated as a restaurant since 1967, chef Stephan Garkischit took ownership in 2003 and was awarded his first Michelin Star in November 2015 thanks to three beautiful regionally inspired menus created with ingredients grown in their own garden. Closed Sunday and Monday. Cash or EC cards only. A Michelin Star restaurant in Kreuzberg may not sound very Berlin hipster, however this affordable venue from Swiss chef and painter Hans Richard offers a more upmarket side to the area. As you would expect from such a creative talent, the dishes are beautiful on both the eye and the tongue. Closed Sunday and Monday. One of the most impressive locations in Berlin, this stunning restaurant is located in a Kreuzberg electricity substation, built in 1925, and boasts a nice summer terrace. Chef Matthias Gleiss's beautiful interpretations of traditional Berlin dishes and German classics are made with regional products and offered as three Tasting Menus or a la carte. Closed Sunday and Monday. Another typical Berlin venue, this tiny Michelin Star restaurant on Torstrasse is so casual it looks more like a takeaway than a fine dining establishment. Andreas Saul's dishes are beautiful, with the two set menus written on blackboards in chalk. Closed Tuesday and Wednesday. This fashionable restaurant offers modern cuisine without neglecting the traditional. Chef Florian Glauert's monthly changing Tasting and a la carte menus offer a composition of flavours, new ideas and traditional French Haute Cuisine using high quality regional products. Every Saturday you can enjoy a hearty Berlin Currywurst with a glass of Champagne on the summer terrace too. This is trendy fine dining without the need to dress up. Open all day every day but Sunday, with late night food available in the bar too. The fine dining restaurant a short taxi ride outside of the city, inside the posh Relais & Châteaux Schlosshotel Im Grunewald, is a place rich in history and tradition and a favourite with celebrities. The stage for beautiful contemporary regional cuisine in a palatial setting. Open every day. Named after the secure area at a motor racing circuit where the cars are driven back to the pits, this small fine dining restaurant can be found in the Classic Remise Berlin - a classic car centre and events space located in what was once the largest tram depot in Europe, dating back to 1901. Open only in the evening, Alexander Goessmann's excellent dishes are available as a daily Tasting Menu or as an à la Carte option. Just 10 minutes walk from Berlin Beusselstrasse S-Bahn Station. Closed Sunday and Monday.